US, 1952, 95 minutes, Colour. Alan Young, Dinah Shore, Robert Merrill, Adele Jurgens, Minerva Urecal. Aaron Slick from Punkin Crick is stage musical comedy in the homespun Rodgers and Hammerstein Broadway tradition - small town, simple hero and heroine. 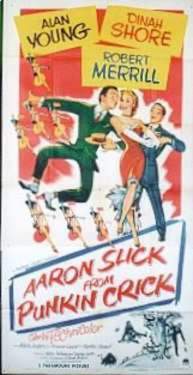 Had it been made at Warner Brothers at the same time, it might have starred Doris Day and Gordon Macrae. Alan Young is a pleasant hero (and was in such films at the time as Androcles and the Lion) and Dinah Shore (who had appeared with Danny Kaye in Up In Arms) is a singer in the Doris Day style. However, they did not have cinema star power but both were very successful on television ? Mr. Ed and The Dinah Shore Show. opera singer Bob Merrill is the villain of the piece. The setting is the backwoods and praise of the pleasant people who live in the country compared with the city slickers. Chicago is presented as the be all and end all of the country folk's dreams, but, of course, life in the city is disillusioning. The score is pleasant but not memorable. This kind of thing was to be very popular with Li'l Abner. 1. An entertaining musical comedy? How memorable, light fluffy entertainment? 2. The traditions of the American musical comedy, especially from the stage? The slight plot, hero and heroine, family, the small town, villains? Colourful costumes and decor? Singing and the pausing in action for the songs? Dancing and styles? The artificiality ? of the marshmallow moon variety? Its popular appeal, changing tastes? 3. Colour photography, the contrived locations, the artificial country town, the farmlands? The transition to Chicago and its affluence? Editing for the songs especially with their parallelism? 4. A humorous plot sufficient for musical comedy purposes ? Aaron and his being at home in the country, Josie and her farm but her dreams of the city? Merridew and Gladys taking refuge in the country, their swindling background, their double dealing with the oil. their comeuppance? The old widow, Mrs. Peabody, and her style? The ordinary folks in the town ? especially on Saturday night? The romance plot, the disillusionment in the city, the final rescue by the hero ? with the help of the dancers and the police? 5. Aaron as the American hero, the naive young nun from the country, his working with Josie, his love of the country as illustrated in the initial song? Josie and her love for him? The patent medicine and his romantic attitudes? Saving her from the Merridews and getting a good price for the property? His loneliness, following her to Chicago, the incident in the convention and his singing and dancing, the mock robbery and his quick thinking., the happy ending? What American values were to the fore in this character? 6. Josie as American heroine? Dinah Shore's style and her singing? Her love for the city and her dreams, her impatience with Aaron, attraction towards Merridew? Reliance on Mrs. Peabody? The selling of the house, the living it up in Chicago, the disillusionment and happy return home? 7. Mrs. Peabody and her humour: not letting Josie ask Mr. Peabody but Mrs. Peabody telling him because he was her husband! The old American humour and wisdom? 8. Merridew and Gladys, their frauds. refuge in the country, Gladys and her clothes and being chased by the bull etc... the swindle of the oil. the visit to Chicago and Merridew's smoothness, the final comeuppance and their selling the patent? 9. The atmosphere of the small country town, farms, shopping, the romance on Saturday night, the carnival atmosphere, church on Sunday etc.? 10. The contribution of the songs and their revelation of character, attitudes, insertion at various parts of the plot? The happy resolution and 'long live the American tradition'?